Following the success of 2009 indie-horror The House of the Devil, American director Ti West brings us The Innkeepers (2011), a new horror starring Pat Healy (The Assassination of Jesse James by the Coward Robert Ford ) and Sara Paxton (The Last House on the Left ). The Yankee Pedlar Inn is closing down, in it’s final weekend the two remaining staff, Claire (Paxton) and Luke (Healy), decide to go in search of the ghost of Madeline O’Malley who hung herself 100 years ago. 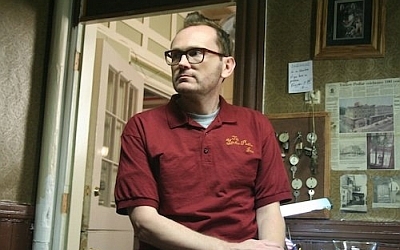 CineVue met up star of the film Pat Healy to discuss his role. Joe Walsh: You’ve had a successful but slow-burning career up until The Innkeepers. Do you have any aspirations of working within Hollywood? Pat Healy: I have been working professionally for 20 years and I have always strived for a career. As a young man, I wanted to be a movie star and it is not that has gone away, but I have had to work hard. The more significant roles are coming to me now that I am older. Frankly, as much as I would have liked that to come earlier on, especially financially, I believe now it is probably better now as I appreciate it more- I feel I have earned it. JW: How do past supporting roles compare with leading roles such as yours in The Innkeepers? PH: It is completely different. I have been in some amazing movies with some incredible actors and directors. I was lucky to world with the likes of Paul W.S. Anderson, Herzog and Michael Bay a few times. But I was a jobbing actor. It is like being on a treadmill and you have to stop every couple of minutes, you don’t really work up a sweat or the full work out. Working on a character for months at a time in a main role you learn more about behaving as that character, it becomes deeper and richer. It is much more satisfying. I have this other career as a screenwriter, and about six years ago that became remunerative for me so I was able to take a break from auditioning. For the most part it meant taking on larger roles in smaller films. This has paid off because now the right people can see what I can do. JW: What attracted you to The Innkeepers, and had you seen any of West’s previous films? PH: We had been briefly introduced at this film festival in 2007 where I was doing this film Great World of Sound and Ti had Trigger Man – we had a great time. Three years later an actor friend of mine, who is really into his horror, said he had seen House of the Devil. I went to see it and I was knocked out by it. It was good fortune that within a few days of me having seen it my friend emailed me to say that Ti was making another movie and wanted me to be in. I called Ti and that was it. JW: It was reported that The Innkeepers had an unusual shoot and that you actually stayed in the hotel featured in the film. How was that? PH: It was cool; we stayed in this hotel that was purported to be haunted. Sara (Paxton) and I ate our meals together there. It was like summer camp and we had a really good time. It is a really good way to make a film when it is an independent movie. The mood was always kept light; everyone had a great sense of humour. I had been cast first and Ti had a hard time casting Sara’s role so we didn’t have a chance to meet before we got to Connecticut, it was a gamble on Ti’s part but it really paid off. That chemistry was definitely bolstered by being in such close proximity to each other. In such situations you develop these close relationships with people. Much like our characters you bond at work, I think it is the same in minimum wage jobs; you have a choice of either be miserable or enjoy each other’s company. It is like that with the ghost being stuck there; you can either be miserable or enjoy it and have fun with it. I like that aspect of both making it and that theme in the movie. JW: What are your personal favourite horror films? PH: As a cinephile, the biggest experience for me in my life as a horror film was Poltergeist (1982) where I think I was ten when it came out and it is still my favourite horror movie. It terrified me to the bones so much that much because it was about a family in a suburban home, which is where I grew up with my parents. In the movie there was nothing that the parents could do to protect the children against these marauding ghosts and monsters that we truly malevolent. I couldn’t watch that movie for many years after I first saw it with my hands over my eyes. It personally affected me and made me feel and think differently about the world, that my parents ultimately protect me against a force that was so strong. It has always been something that stayed with me. Ti West’s The Innkeepers is in UK cinemas now, and you can read our review here. The film will also be released on DVD on 25 June, 2012.